This picture was taken one year ago today. Katie still looked like a baby raisin. I didn't know it at the time though. It's funny how things are so much easier now, but also harder at the same time. It's also funny how you can't wait to see your baby grow up and do different things, see their personality, but at the same time you are losing your baby. It's kind of breaking my heart. I want my tiny baby, but also want to play with my big girl. There are so many things I can't wait to do with her as she gets older, but I still want to hold her and feed her a bottle. Here is the big girl eating her apple jacks and juice all by herself. She still can't dress herself, read, walk, or use the toilet, so I guess she still needs me for a little while longer! 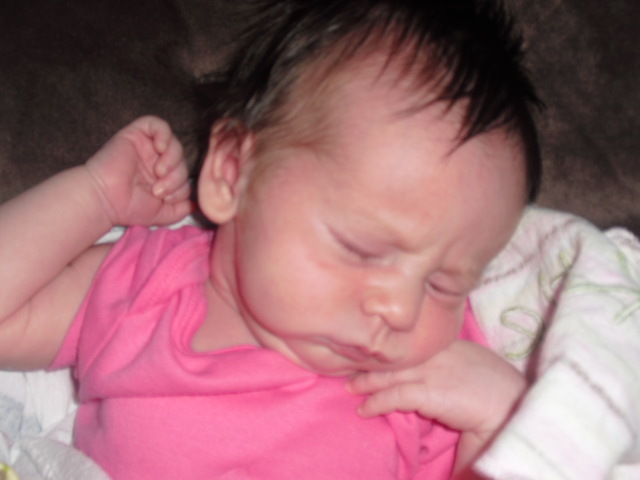 And she sleeps 12 hours in a row at night, so that makes me grateful 1 year old Katie and not miss 2 week old Katie! Anybody else feel a little schizophrenic about your babies growing up? You are not alone! I'm right there with you. Except my girl is 3 and I think all traces of her baby-ness are gone. :( DO NOT, I repeat, DO NOT watch any home videos of her when she was a little baby. It will make you cry! Or at least I cried when I made the mistake of doing this around her birthday. And you are totally right, there are good and bad things about the different ages. Like right now, since Sophia is 3, she's potty trained (no more diapers or pull ups). Eats what we eat (no easy task but now no formula or baby food). The downside, TANTRUMS. Although, maybe you'll have it easier with those, Katie seems pretty easy going. But you are definitely not alone! Makes me want another baby but I don't think that's in the cards for us. YES! Ava just turned 4, and she's hilarious, sweet, content, and I could go on and on. So I love it, but I miss having a tiny baby! Yes! Mine are 26 and 21 and I still miss those baby days. I'm 48 and my mom still has dreams of me as a baby and little girl. And once Katie learns to do all those things, she will still need you. There will be a few years where she doesn't think she needs you, but she'll come back to her senses and decide you really do know what you're talking about. Just remember to hang on tight during those tween and teen years and you will make it through and have a best friend! I just sent my baby girl off to the 3rd grade this morning. 3rd grade!!! I remember like it was yesterday the day she was born...every single minute. :( So bittersweet. My baby is 9 months so I love seeing what Katie is doing so I know what I have to look forward to - she's such a doll! Totally agree about growing up but still wanting her to be a baby - makes me so sad! I noticed Katie's sippy cup - how did you transition to it? My baby has NO interest in anything but a bottle. Haha! I laugh and cry about this all the time! Gray just turned 1 as well and I don't know whether to happy about it or sad!! I LOVED the baby phase (he was actually a great sleeper) but this age is SO MUCH FUN!